It was a cold night in Connecticut’s north woods, but frigid temperatures didn’t stop Donna the Buffalo’s fans ­– collectively known as the Herd ­– from gathering for a one-nighter with the band at Infinity Hall in Norfolk. Donna isn’t a jam band, but they have the following of one – devoted fans that collect their concert tapes and follow their never-ending tour. Their shows are often epic affairs, driven by a strong book of road-hardened songs from guitarist Jeb Puryear and fiddler/accordion player Tara Nevins. The band plays electric roots music, new tunes out of an old tradition, with influences ranging from rock, reggae, and old-time country to zydeco and beyond. The Grateful Dead – to whom they’ve certainly been compared – did that too, but Donna approaches it the way the band Joy of Cooking did: close to the ground, with the roots clearly showing. Sure, they jam, but don’t expect self-indulgent, look-at-me solos. Everything that happens onstage at a Donna show is in service to the song. It may not always be readily apparent, but Nevins and Puryear are carrying on the tradition of pre-bluegrass old-time music, where collective improvisation is the rule: everybody’s listening and bouncing off each other, without egos getting in the way. Considering how long they’ve been playing together, it’s easy to place Donna the Buffalo under the category of “the music of friends, give and take, back and forth.” And, to hear its founding members talk, that’s exactly their aim. 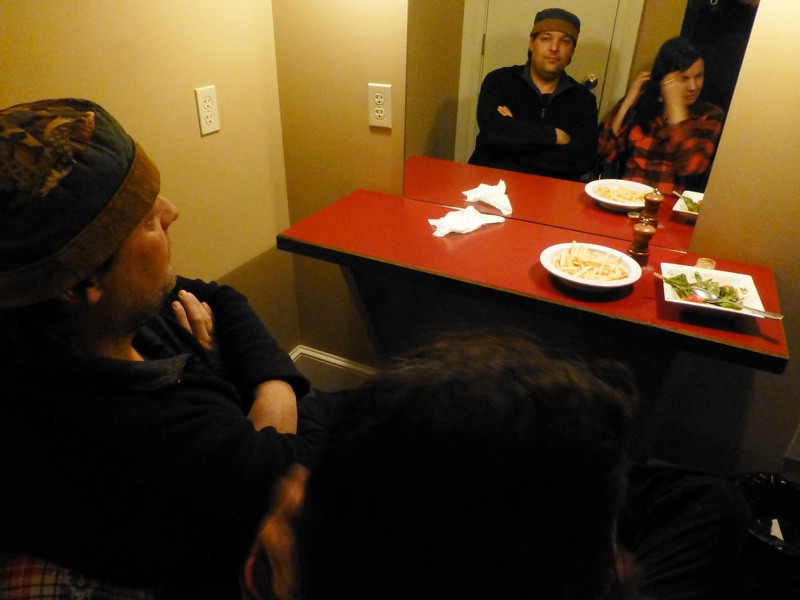 In a cozy green room tucked away from the evening’s chill, Nevins and Puryear get through another day on the road, finishing the dinner brought down from the kitchen. They seem receptive to the idea of talking about the old-time roots of a joyfully electric band, but we have to get the jam band stereotype out of the way first. Growing up in Orangeburg, New York, Tara Nevins started on the classical violin at age five, got a guitar at 14, and learned to play radio hits by Carole King, Elton John, and Joni Mitchell. She played violin in the high school orchestra. But the girl who wore go-go boots had her real epiphany on hearing the Nitty Gritty Dirt Band’s Will the Circle Be Unbroken – a magic door into roots music almost as important as the Anthology of American Folk Music for an earlier generation. Her roommate at the Crane School of Music at SUNY Potsdam in the 1970s was in the St. Regis River Valley String Band, and soon Nevins was, too. For her and old-time music, it was love at first sight. The big name at the time was the Highwoods String Band, known, Puryear says, “for their incredibly energetic shows, a kind of hippie-hop. My playing fiddle was in part in the hopes of becoming famous like those guys.” He goes on to say how much he learned from his fiddling heroes – men like Tommy Jarrell and Benton Flippen. Jarrell was one of many influences he and Nevins shared. Nevins was doing the same thing, digging old-time guys like Dock Boggs, Fred Cockerham, and Kenny Baker, attending events like the Mount Airy and Galax fiddlers conventions. “We were after the nuances,” she says. One time at a festival, she was complimented by Jarrell’s banjo player for playing “Sally Anne” just like Tommy. She remembers that fondly, before adding, matter-of-factly, “Well, I learned the tune from a Tommy Jarrell recording.” Puryear calls that “playing the scratches on the record,” but the two of them – occasionally playing together by then – were not fated to become folk Nazis or grim-faced guardians of the tradition. The Heartbeats made only one record – Spinning World, in 1993 – but it’s a darned good one, combining old-time classics like “Cotton-Eyed Joe” and “Blue Diamond Mines” with contemporary finger-snappers like “Hollywood Dream” and “Living in Babylon.” The group was together for a decade, overlapping with the founding of Donna the Buffalo. One of The Heartbeats, Beverly Smith, later joined old-time demigod Bruce Molsky in Big Hoedown. Molsky, no purist himself, says he’s a huge fan of The Heartbeats, holding them up to his students, he says, “as an example of a band that used old-time music, among other things, to develop a unique and great voice of their own way back when.”. Early Donna showed its roots far more than the group does today – another old-time giant, Dirk Powell, played with the band for a time. But it was placing old-time music in a modern context that helped pique Puryear’s interest in Nevins’ talents. He explains that she was “the first person I met who wrote songs I could imagine hearing on the radio.” Before long, he started doing exactly the same thing – with a kind of “Get Together” populism being a major theme. St. Regis and Bubba were simpatico by this point. “We played music together a ton,” Nevins remembers. When they were looking for something to name the band, a friend came up with a name that sounds like it was secured from a newsreel, “Dawn of the Buffalo.” The group misheard it as “Donna the Buffalo,” and everyone loved that. The new mishmash was nameless no more. The group officially formed in 1989, which means they’ve been on the road for more than 25 years. It’s fair to say that just picking up electric instruments doesn’t mean an immediate proficiency on them. “People thought we were a crappy band for a long time,” Nevins admits. It’s fair to say the band didn’t remain crappy for long; Nevins and Puryear successfully adapted their playing styles to electric instruments, and they added members who came out of rock and jazz bands. Only Nevins and Puryear remain from the first lineup, the earliest manifestation of which is documented in a homemade Dirk Powell-produced cassette-only release called The White Tape (1989, followed by The Red Tape, 1991, with Mitch Easter producing). Nevins’ ex-husband, Jim Miller, was in that version of the band, playing guitar and singing, as were both Richie and Jennie Stearns – the former on keyboards, the latter on guitar and vocals – and Jeb’s brother Jordan, on bass. Their self-titled official debut CD was released in 1993, evenly split between Nevins and Puryear originals. By that point, Nevins had become infatuated with Cajun and zydeco music, and her newly acquired accordion skills became the driving force in the band’s earliest shows. The traditional influence is strongest in early Donna lineups that featured old-time fiddle players Joe Thrift and Jimmy Triplett. One could fill pages listing all the members to cycle through during the band’s numerous personnel changes, but these days it’s a quintet with former Buddy Guy and CJ Chenier keyboardist David McCracken, Berklee grad and jazz bassist Kyle Spark, and drummer Mark Raudabaugh – another jazz guy. The band’s on the road at least a third of the year, averaging 110 gigs a year. Indeed, the constant touring is why the Herd keeps getting bigger. Nonetheless, Donna’s roots still show in all kinds of ways. For one thing, influenced by Rhode Island’s Rhythm and Roots blowout, they’ve run the Grassroots Festival – now in multiple locations – since 1990. The original location is in Trumansburg, New York, in the Finger Lakes. But the festival now encompasses a second venue, as the Shakori Hills Grassroots Festival of Music and Dance in North Carolina, and a third as The Virginia Key Grassroots Festival in Miami. Donna has also taken its extended family on the road with the Roots Tour, featuring one-man band John Specker, the Overtakers reggae band, Preston Frank and his Zydeco Family Band, and others. It’s all grist for the mill. There’s no arguing with that. Donna’s sound is indelibly their own, and quite different from the Dead’s truckin’ boogie and the tennis match improvisation of so many jam bands. But one thing Donna shares with the Dead is outlook: they’re both democratic, people’s bands. At the Gathering of the Vibes in Connecticut last year, after a high-energy set, Puryear wandered out into the Woodstock-like encampments in front of the main stage. Far from playing the conquering rock star, he was just another member of the tribe, trying to find some shade. Soon it’s showtime, and Donna rocks the Infinity. Despite this being a sit-down theater, no one sits still long. It’s an older crowd, but some members of the Herd have brought their teenage kids. Two hours later, the groove was still rock solid, but I was fading. The great thing about Donna is there’s always a next time. Join the Herd and follow Donna’s road schedule ­– they’re on the road through March. The band’s discography is 10 records deep, but maybe Live from the American Ballroom (2002) is a good place to start. The fan site is here, and a voluminous archive of free Donna shows is here. Tara Nevins has two solo albums, the first of which, Mule to Ride, is focused on fiddle tunes, and the second, Wood and Stone, has a more Donna-like sound featuring, among others, Levon Helm. The group’s most recent album is Tonight, Tomorrow and Yesterday (2014). Jim Motavalli, a proud member of the Herd, has been writing about music since the 1970s for such publications as Paste, Country Music, Living Blues, the Advocate Newspapers and his own blog. He hosts a bimonthly radio show with plenty of live music on WPKN-FM in Bridgeport, CT.